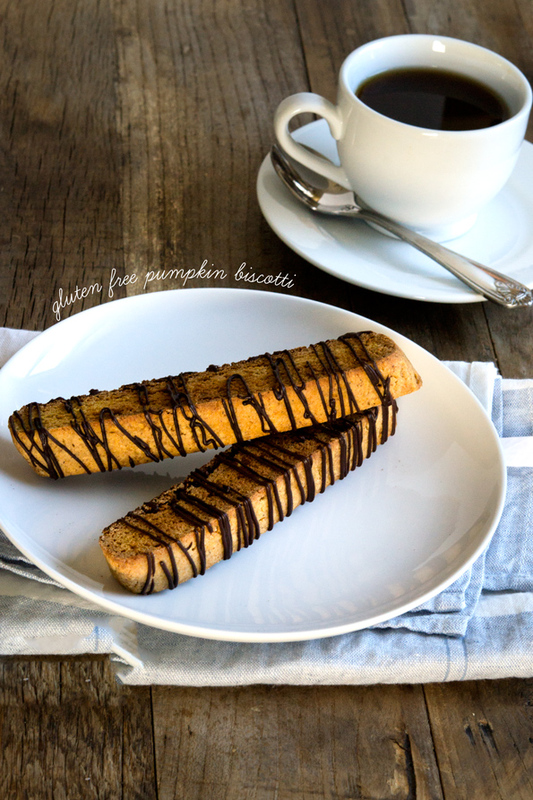 Gluten Free Pumpkin Biscotti | Great gluten free recipes for every occasion. The ultimate in crispy crunchy pumpkin cookies, these gluten free pumpkin biscotti are twice-baked just like classic biscotti. 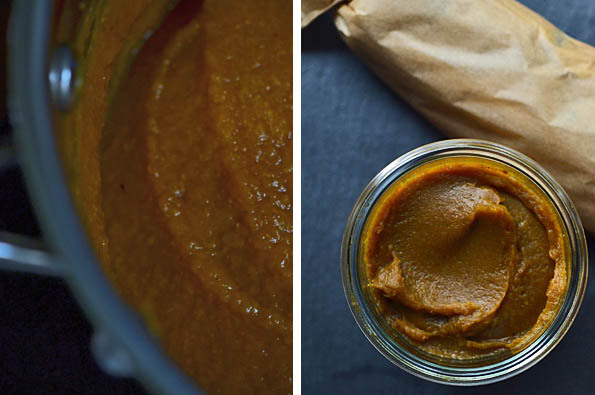 Baking with pumpkin butter is what keeps them crispy, and full of the flavors of the season! Get ready, ’cause it’s time. There’s a chill in the air (most days) and I’m busy selecting the perfect fleece to wear. It’s really time! Halloween is right around the corner, with the annual Thanksgiving Food Olympics not far behind. That means … I can justify baking with pumpkin! 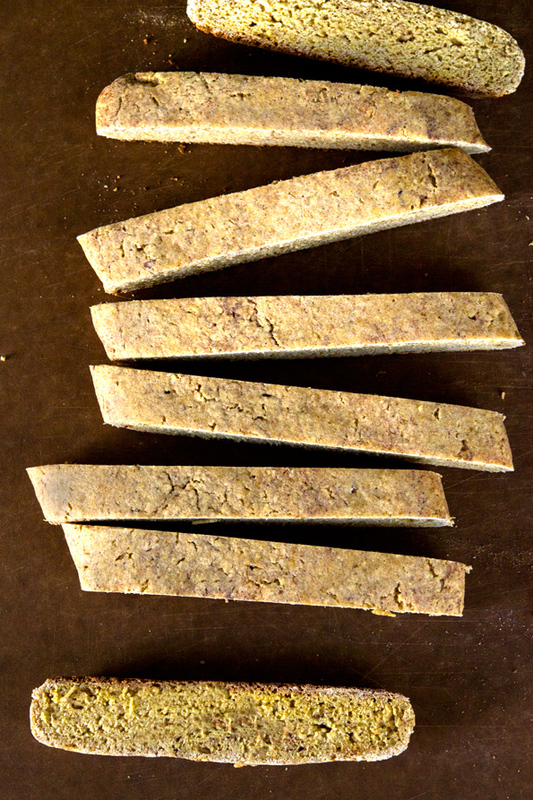 We’re starting with gluten free biscotti, since these crunchy tea cookies give me an excuse to show you how to make your own pumpkin puree and pumpkin pie spice. You’ll need plenty of those this season! For a completely different pumpkin cookie experience, try these cake-like Gluten Free Pumpkin Cookies from What The Fork. I drizzled the pumpkin biscotti with some melted chocolate, since honestly pumpkin and chocolate go together like hand in glove. And anyway look how pretty! These crispy, crunchy biscotti are perfect for your morning coffee. Or a nice, hot cup of tea mid-afternoon. Oh I just love this season! Well, scroll down, friend. I’d be happy to show you how to D.I.Y. that, too. We’re in this together. Now let’s make some authentic biscotti. *To make your own pumpkin pie spice, combine 2 teaspoons ground cinnamon + 1 teaspoon ground ginger + 1/2 teaspoon allspice, 1/2 teaspoon ground cloves + 1/4 teaspoon ground nutmeg. In a large bowl, place the flour blend, xanthan gum, baking powder, salt, sugar, and pumpkin pie spice, and whisk to combine well. Add the egg, pumpkin butter and vanilla extract, and mix to combine well. The dough will be thick and sticky. If necessary to bring it together, knead the dough with wet hands until smooth. Place the dough in the center of the prepared baking sheet, and shape with wet hands into a loaf that is approximately 7 inches long x 3 inches wide x 1 inch thick. Place in the center of the preheated oven and bake until lightly golden brown and firm to the touch, about 20 minutes. Remove from the oven and allow the loaf to cool for at least 10 minutes, or until only slightly warm to the touch. Lower the oven temperature to 300°F. Slice the loaf in cross-section on the bias into 8 to 10 pieces, each about 1/3 inch thick. Place the pieces back on the prepared baking sheet, flat and spaced about 1 inch apart. Return the baking sheet to the oven and bake for 10 minutes. Flip each of the cookies over on the baking sheet, return to the oven and finish baking until the underside of the cookies is lightly golden brown (about another 10 minutes). Remove from the oven and allow to cool to room temperature before serving. The cookies will crisp as they cool. Drizzle with melted chocolate, if desired. Store biscotti at room temperature in an airtight container for 2 days. Freeze any leftovers tightly wrapped in a freezer-safe container. Hallelujah! THIS is something I can make and eat! I am both Gluten and Dairy Free! I was so excited with the recipes until I started reading ingredients and some included cream cheese or sweetened condensed milk, etc. In some things I can substitute Almond Milk but I don’t think that will sub for cream cheese or S.C. milk. Thank you for all you do! Did you ever know that you’re my hero, Nicole? 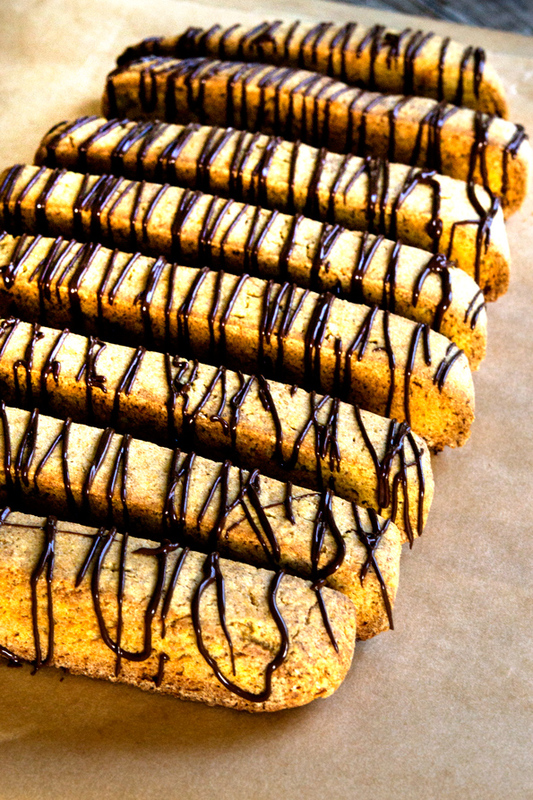 I’ve never even dreamed of pumpkin biscotti, and there you making it ::gluten-free:: of all things! I cannot wait to try this recipe! Can I come over???? Pleeeeeeeeeeeeeeeeeeeeeze??? I cannot thank you enough! I was known as the biscotti queen of several family lines and the Xmas before I was diagnosed I made a record number of batches – and suffered a record bout of “glutenitis” (or glutten itis!) You have given my family back their favorite Xmas gifts from me — cuz now I won’t be tempted by their regular stuff!!!! THANK YOU THANK YOU THANK YOU! These look delish! Don’t’ know what I’d do without you and your recipes! Is the honey needed for the butter or can a regular sweetener work? Do you mean the maple syrup, Richard? You could use granulated sugar, I’m sure, but the flavor wouldn’t be nearly as deep. Drooling here! You make me want to quit my job and stay home and bake all day long…and I am not one who generally likes to bake–wait a minute, it isn’t the baking, it is the cleaning of the mess involved with the baking that I do not like! 1. Replacing the canned pumpkin with fresh? I’m in the UK and tinned pumpkin is not available readily that I can find (at an affordable price), but I can get my hands on fresh easily and cheaply. How would I replicated this? Literally just boil in salted water, strain till dry and blend? or do i have to do something not obvious? 1. Since the amount of pumpkin puree in the recipe is by weight, I’d slice a fresh pumpkin in half, remove the seeds, and roast it (skin up) until tender. Then remove the skin and puree, and use 15 ounces of that to make the butter. 2. It’s just for flavor, really. Go crazy – but keep in mind you want a flavor that marries with pumpkin. Not so sure about mango juice! I love anything pumpkin and these look great. How would we use pumpkin butter in the pumpkin chocolate chip bars in book 1? just swap it out 1 for 1? Oh and I’ve already bought 2 cans of pumpkin prepping for the fall haul of pumpkin recipes! can’t wait! Love it, Jennifer! Actually, you wouldn’t be able to sub in pumpkin butter for pumpkin puree 1:1, since they’re pretty different in moisture content. I will play with that recipe and maybe post another version of it with pumpkin butter instead of puree. That recipe is one my husband begs me to make every single year! Did somebody say pumpkin chocolate chip bars?? ?